The FORS1 instrument on the ESO Very Large Telescope (VLT) at ESO’s Paranal Observatory was used to take this exquisitely sharp close up view of the colourful Jewel Box cluster, NGC 4755. The telescope’s huge mirror allowed very short exposure times. A new set of images made with three different telescopes aresome of the best ever taken of the sparkling ?Jewel Box? star cluster, showcasingthe evolution of the stars within. The Kappa Crucis Cluster, also known as NGC 4755 or simplythe ?Jewel Box,?is just bright enough to be seen with the unaided eye. It lies about 6,400light-years away in the southern skies near the Southern Cross in theconstellation of Crux. It was given its nickname by the English astronomer JohnHerschel in the 1830s because the striking color contrasts of its pale blue andorange stars seen through a telescope reminded Herschel of a piece of exotic jewelry. 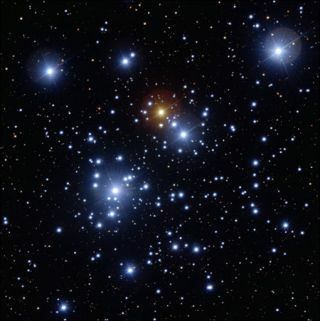 Open clusters such as NGC 4755 typically contain anythingfrom a few to thousands of stars that are loosely boundtogether by gravity. Because the stars all formed together from the samecloud of gas and dust their ages and chemical makeup are similar, which makesthem ideal laboratories for studying how stars evolve. The Jewel Box cluster can be seen in a combination of imagesfrom the European Southern Observatory's Very Large Telescope on Cerro Paranal, Chile, the MPG/ESO 2.2-metre telescope at ESO?s La Silla, Chile, observatory and the NASA/ESA Hubble Space Telescope. The image taken with the Wide Field Imager (WFI) on theMPG/ESO 2.2-metre telescope has a large field of view that shows a vast numberof stars, many located behind the dusty clouds of the Milky Way and thereforeappear red. The FORS1 instrument on the ESO Very Large Telescope (VLT)allows a much closer look at the cluster itself. The telescope?s huge mirrorand image quality give a very sharp view despite a total exposure time of just5 seconds. Observing the cluster from space allows the NASA/ESA HubbleSpace Telescope to capture light of shorter wavelengths than can not be seen bytelescopes on the ground. The new Hubble image (taken near the end of the longlife of the Wide Field Planetary Camera 2) of the core of the clusterrepresents the first comprehensive far ultraviolet to near-infrared image of anopen galactic cluster. Several very bright, pale blue supergiant stars, a solitaryruby-red supergiant and a variety of other brilliantly colored stars arevisible in the Hubble image, as well as many much fainter ones. The differentcolors result from the differing intensities of the stars at differentultraviolet wavelengths. The huge variety in brightness of the stars in the clusterexists because the brighter stars are 15 to 20 times the mass of the Sun, whilethe dimmest stars in the Hubble image are less than half the mass of the Sun.More massive stars shine much more brilliantly. They also age faster and makethe transition to giant stars much more quickly than their faint, less-massivesiblings.